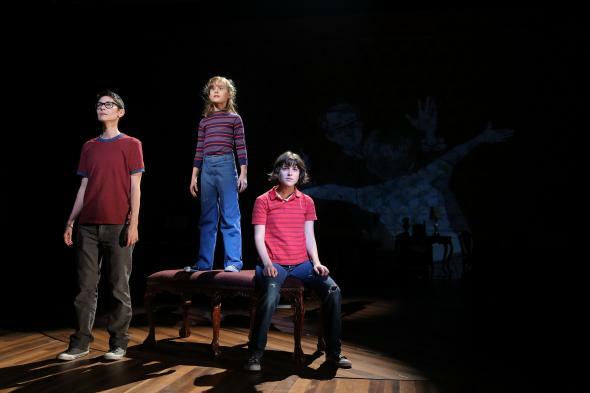 October 19 – The musical Fun Home at the Public Theater is a rich intense meal of a show. 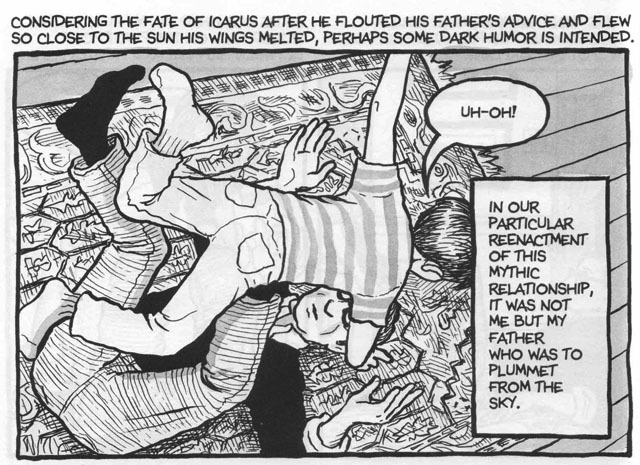 It’s an adaptation of the award-winning graphic memoir by Alison Bechdel, the great cartoonist best-known for her comic strip “Dykes to Watch Out For,” about growing up in a funeral home, coming out as a lesbian, and her relationship with her father, who was a closeted gay man and committed suicide not long after she came out to him. Jeanine Tesori wrote the score, which is quirky and deep and includes fantastic roles for young kids, not unlike “Caroline, or Change.” And the book and lyrics were written by Lisa Kron – I enjoyed seeing traces of Kron’s own family memoir, 2.5 Minute Ride, show up here. The first half of the show is a little lumpy and awkward as the story jumps around in time, portraying Alison at three different ages – the 9-year-old daddy’s girl (Sydney Lucas) who is transfixed at the fleeting sight of a butch lesbian, the college girl (Alexandra Socha) whose life is transformed by her first fling (Joan, played by Roberta Colindrez – “Tako” from Girls), and the adult cartoonist (Beth Malone), who spends a lot of time standing on the sidelines watching her earlier selves. But the musical numbers are as unpredictable and specific as Bechdel’s fantastic writing (a commercial for the funeral home, a Partridge Family tribute, a lovesong to that butch lesbian called “Ring of Keys”). And once grown-up Alison sits down for the car ride and conversation she never had with her gay dad, I was an emotional wreck. 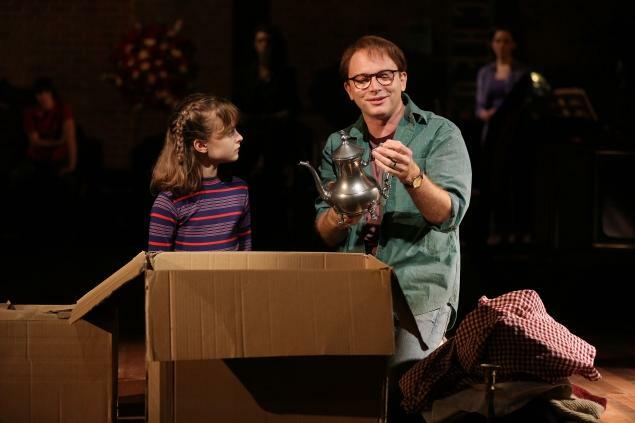 Michael Cerveris (below, with Sydney Lucas) is spectacular as mercurial Bruce – brilliant, kind, demanding, secretive. David Zinn’s elaborate set especially serves to reveal depths of Bruce’s character beyond words – his love of beauty, his attachment to surfaces and masks. Afterwards, Andy and I stumbled out into the lobby, where a whole other emotional experience unfolded. Bechdel was in the house, and we got to meet not only her (Andy could barely contain his fanboy delight) but also Edie Windsor, who’d already seen the show once before and loved it so much she went back, with her publicist, the indefatigable Cathy Renna. 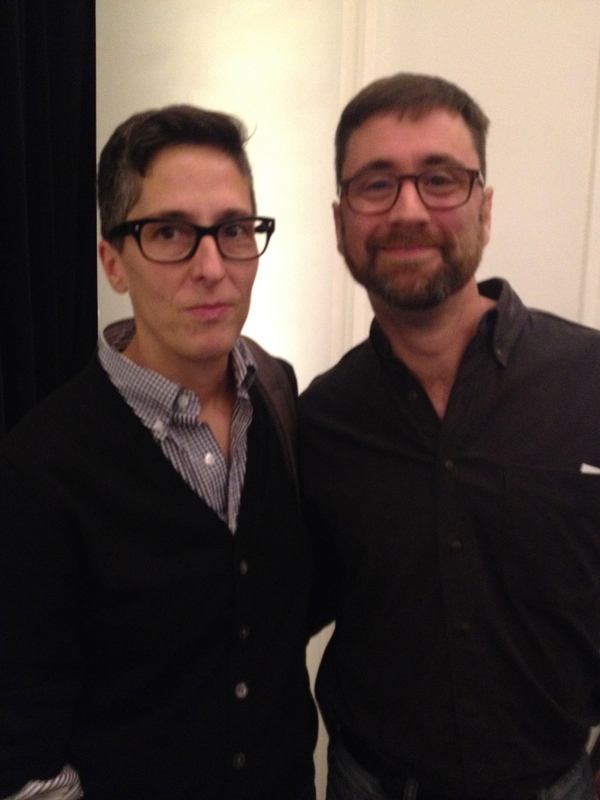 Chatting with two legendary lesbians topped off the evening spectacularly. October 20 – I’m not really sure what David Adjmi’s play Marie Antoinette is really about, other than retelling the historical tale of the French monarch’s rise and fall in 21st century language, a la Sofia Coppola’s movie. 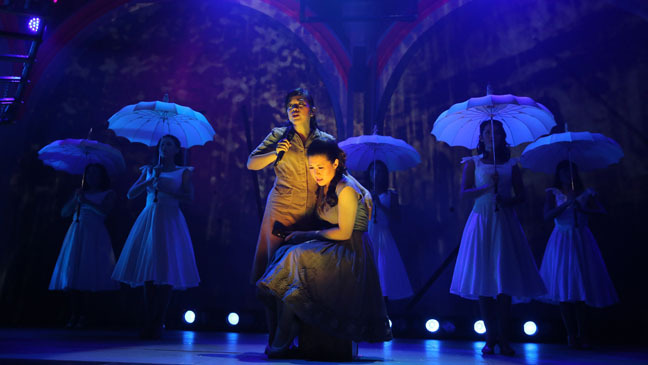 But it does provide the occasion for an amazing performance by Marin Ireland in the title role (below, with Marsha Stephanie Blake and Jennifer Ikeda). I’ve seen Ireland give any number of admirable performances, including her previous gig at Soho Rep in Sarah Kane’s Blasted, but I’ve never seen her undertake such a stylized role. It’s pretty great, beautifully directed by Rebecca Taichman. 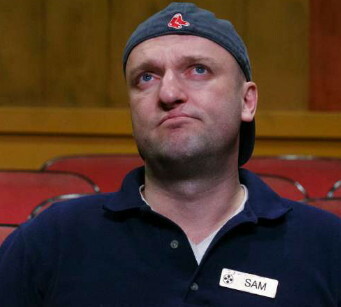 All the actors are superb – there’s a tiny Cassandra-like role for A Sheep, and the production was lucky enough to land David Greenspan to play it. 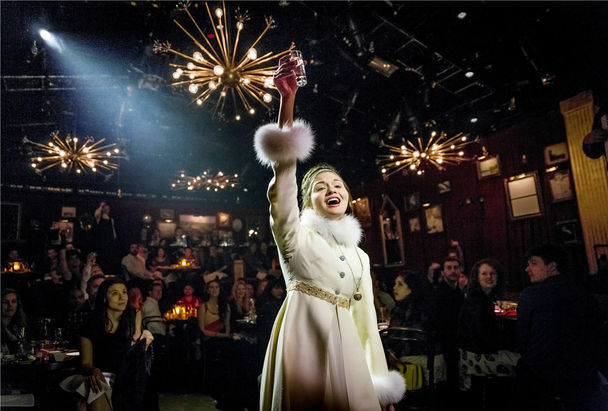 The production design has been stripped down from previous incarnations at the American Repertory Theater in Boston and the Yale Rep. It’s pretty bare-bones but suitable to the intimacy of the Soho Rep space. October 23 – I’ve been a big fan of Stephen Sondheim’s Merrily We Roll Along ever since I saw the original Broadway production, somewhat misbegotten, poorly reviewed, and quickly shuttered (though the cast album holds up very well even now). I’ve seen it onstage again several times, and I was happy that I had an evening free to catch the screening at the Ziegfeld of the live broadcast of the recent London production staged by Maria Friedman. 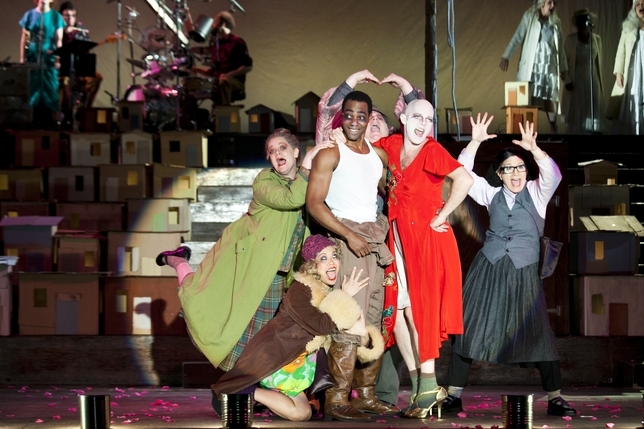 Many have touted this as the best production of the show ever, including Sondheim himself. 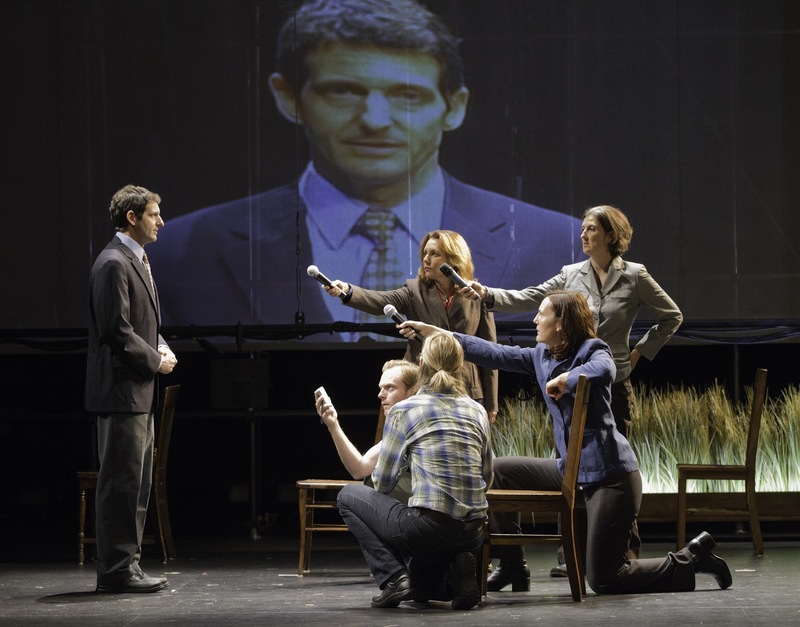 There are a few things it does extremely well – it establishes from the first scene that the entire show consists of what in 12-step circles is called “a searching moral inventory” by the central character, Franklin Shepard: how did you get to be you? How did it happen? 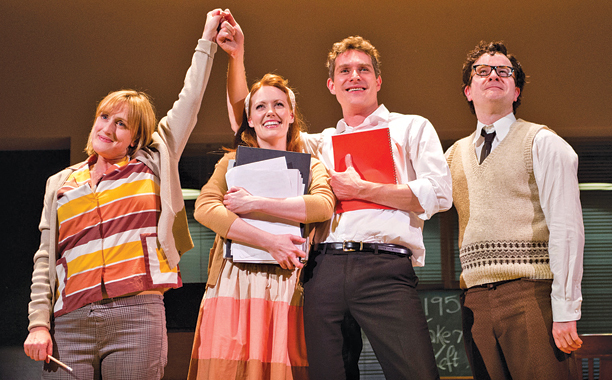 A key image that no other production has introduced is Frank (played by Mark Umbers) clutching a red-bindered copy of his friend Charlie Kringas’s play at the end of the opening scene. As the show moves backward in time, we see this script show up again and again, symbolizing the numerous opportunities Frank had to pursue the artistic ideals he had when he was a kid and the myriad times he chose to postpone or override them in favor of commercial interests or other people’s values. Although it’s always been subliminally obvious, this production makes unmistakeable that Mary (Jenna Russell) has been in love with Frank from the moment they met on a tenement rooftop in New York City. Russell, who played Dot in the London revival of Sunday in the Park with George (which subsequently came to Broadway), gives an excellent performance, as does Damian Humbley as Charlie. (Pre-show backstage footage reveals that, underneath his wig and glasses and shambolic Charlie attire, Humbley is one hunky Australian actor.) Otherwise, though, I found the production to be pretty mediocre – overacted, cartoonish, a few ideas pounded home relentlessly. I still think the best version of Merrily was James Lapine’s production at the La Jolla Playhouse in 1985 starring John Rubenstein, Chip Zien, and Heather MacRae. And the second-best was Lapine’s staging last year for the Encores! series at City Center with Colin Donnell, Celia Keenan-Bolger, Lin-Manuel Miranda, and Elizabeth Stanley, who was a revelation as Gussie. October 30 – Speaking of the Franklin Shepards of the world…the last time I had contact with singer-songwriter Robert Kraft, it was the mid-1980s, and he was excited because Harold Prince (producer and director of many Stephen Sondheim shows, including Merrily We Roll Along) had taken an interest in developing a musical by him for Broadway, a show called Metropolitan Serenade. 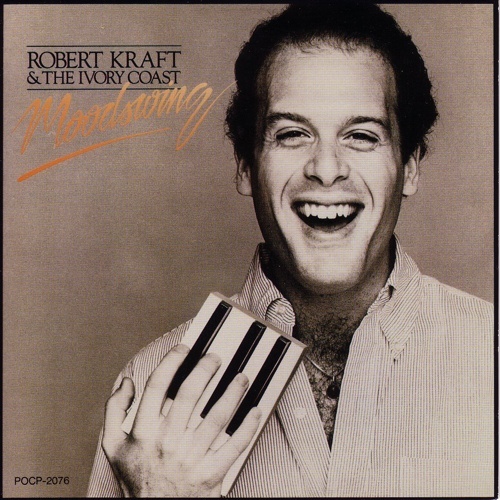 Robert recorded three albums during this period, full of whimsical and tuneful original pop-jazz compositions. 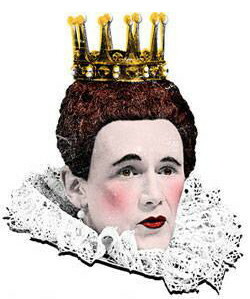 I remember he did a show at the Bottom Line with Patti LuPone singing songs nominated for Academy Awards. Then he moved to Los Angeles and vanished from my radar. I was vaguely aware that he had gotten involved with Hollywood in some capacity as music director, but I never knew the details (I’ve since looked them up on Wikipedia). A couple of years ago we became Facebook friends, and then suddenly here he is, doing a gig at Joe’s Pub to celebrate the release of a boxed set of his studio albums and a never-released live album. He sat at the piano and played a bunch of his songs from 30 years ago – “Who’s Seducing Who,” “Out with My Ex,” “False Start,” “Café Society” – accompanied by a former student, Katie Theroux, on upright bass. I learned from the show that he’d collaborated with his buddy Bruce Willis (who was in the audience at Joe’s Pub) on the movie Hudson Hawk and he was nominated for an Academy Award for a song he wrote for the movie version of Oscar Hijuelos’s lovely novel The Mambo Kings Sing Songs of Love. (I also learned from him that Hijuelos just died recently – sad.) I will probably buy the boxed set when it comes out in December, to have CD versions of beautiful ballads such as “Bon Voyage” and “Rosette.” Robert apparently spent almost 20 years supervising movie music for Fox Filmed Entertainment…but what about that Broadway show?